Note that the circle images are pretty sparse. Although you could still find some interesting images by zooming into the border, this is a good opportunity to discuss the size of orbit traps and how to change them. 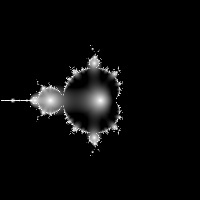 You will recall from our discussion of how orbit traps work that the fractal image contains copies (albeit distorted) of the original orbit trap shape. If the original orbit trap is made larger or smaller, the images will also become larger or smaller. 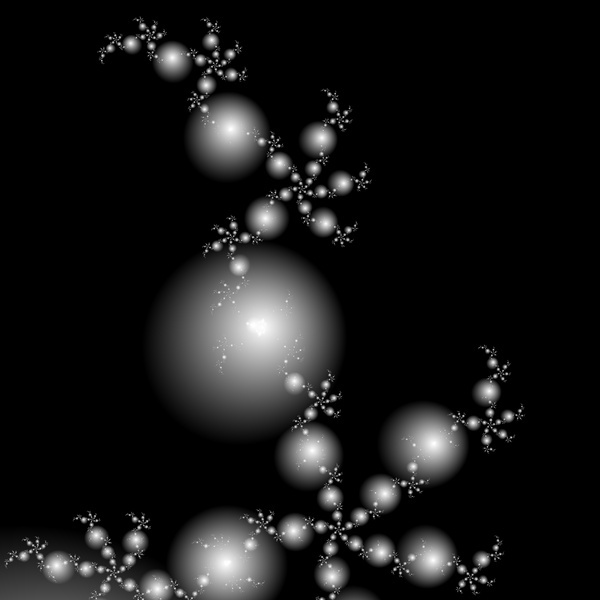 The “right” size for an orbit trap depends on the fractal formula being used, the region of the fractal being magnified, and the taste of the user. Generally, though, the circle and square orbit traps require a bigger initial size then the stalk orbit traps. This is because the cross shape that gives rise to the stalks is in principle infinite in extent whereas the circle and square are limited in extent in all directions. Even with stalks, you may sometimes want to make the size smaller or larger. Using a smaller size, for instance, can improve an image in which the stalks appear too “fat” and overlay each other too much. 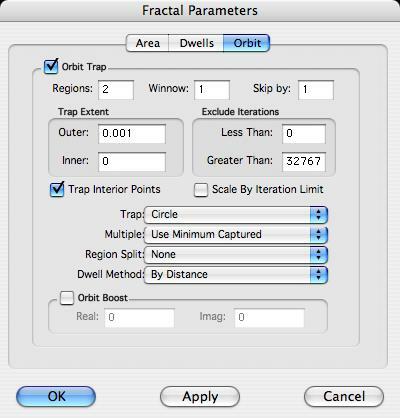 The parameter that controls the size of the trap is the “Outer” parameter under the heading “Trap Extent” in the Orbit dialog box. 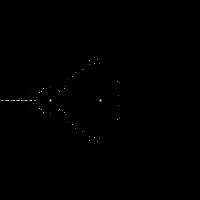 It is important to note that the value it starts out with by default, 0.001, was chosen to be a good average value for the cross or “stalk” orbit trap. It is generally too small for circle and square orbit traps, so when you are using one of these, the first thing you probably want to do is change the “Outer” parameter to something larger. As an exercise, try the same thing with the “square” orbit trap. Be sure to increase the outer extent before you start zooming.